Those skippers not presently club members are welcome to join in on the races however to compete in the series they must join up. If you wish to compete or crew on other boats please show up at the clubhouse ( white building south harbour) at 9:00 am. The races begin at 10:00 am and last about 2 – 3 hours. All crew must have an approved personal flotation device each and all boats competing must meet club safety standards. All boats must have a functional VHF radio and monitor 68 ( our working frequency ) and channel 16. As we are also using GPS designed points for some of our marks some sort of GPS device ( even smart phone ) is recommended. A chart of the points and marks will be provided at race meeting but is attached to this email as well. We will race every Saturday (weather permitting) with the last race being on June 8th for a total of seven races with the best six counting for series. The two exceptions will be on the Easter long weekend ( 19-22 April ) when crew and boats can race in the Southern Straights and when our boats will compete in the annual Algerine race which will be held on Sunday, May 19th. 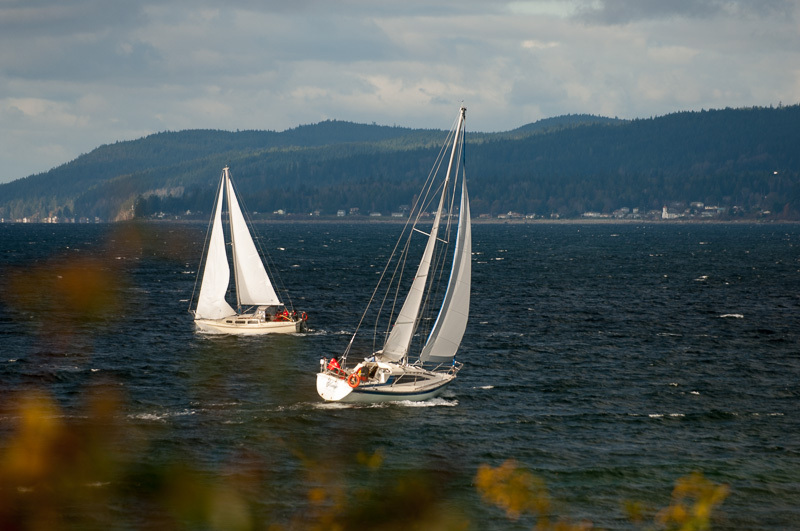 This year the Algerine will begin in the Powell River harbor and end in Comox. 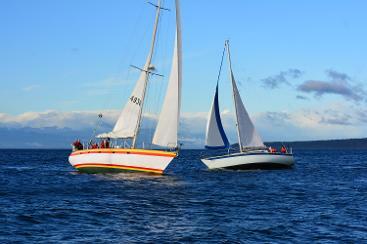 The Comox boats will need to cross over to Powell River on Saturday, May 18th. and spend the night in Powell River to be ready for the race. We especially like to see any new or old club members come out and race and pick up crew are always welcome ( bring a friend ). As well as the great camaraderie there is the huge bonus of being able to develop your sailing skills with all the accompanying support and friendly advice you could ask for. If you have any thoughts or questions please email or call me at 604 483-9273 ( home ) or cell 604 483-1035. If your boat has changes or you wish to discuss your PHRF call me as well. The lucky sailors participating in the 2018 Shearwater experienced a day any sailor would relish and glorify for a lifetime. Starting at Willingdon Beach our course took us around Harwood Island clockwise and then back to Willingdon, a distance of roughly 30 kilometers. Not only was the weather wonderful for the 10th of November with plenty of wind to fill our sails and glorious sunshine to warm us but more amazingly the sea was alive with life. 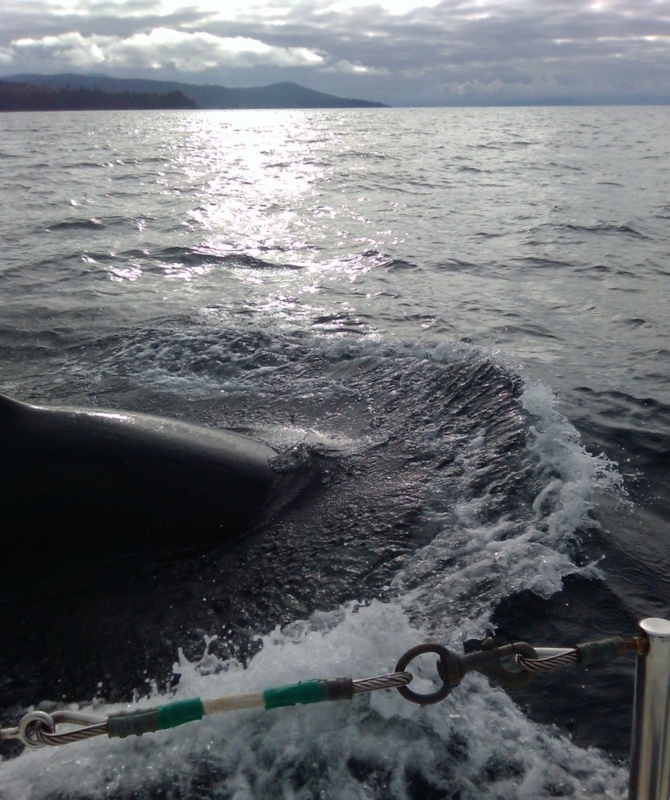 First it was the humpbacks rising and blowing on every horizon before groups of playful Orcas showed up seemingly cheering us onward in our quest. One large male even adopted Kindred Spirit for several minutes giving the crew some pretty amazing luck as they propelled from somewhere near the back of the pack into 2nd place. Herds of sea lions barked their warnings from the shores of Vivian Island while others along with seals seemed unconcerned as they splashed and frolicked around us. Maybe the Orcas were the Resident type that don’t eat seals or maybe everyone was just in too good a mood to be frightened. Our course took us through huge flocks of seagulls that looked as though shear numbers would block or slow our passage but they parted willingly allowing the sailboats their silent passage unhindered before closing ranks in their wake. And the race was completed by a very respectable 3:00 PM., Séance being first to cross the finish line with Kindred Spirit just 6 minutes behind. 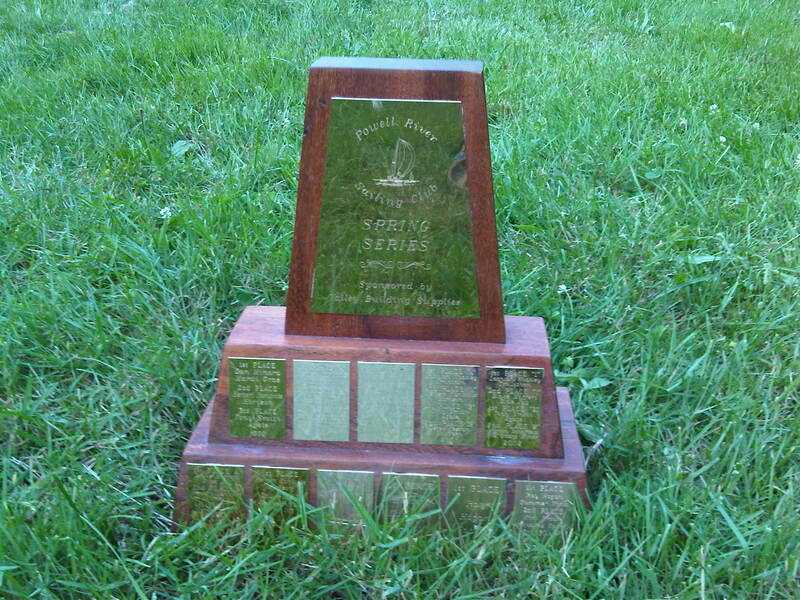 Corrected times according to PHRF ratings showed a different outcome however as Una and crew were presented with the Shearwater trophy for 2018. It was the final race of the Fall Series. Winds were from the south east at 15 – 20 knots and rising. Una was leading the series with 10 points while Kindred Spirit and Séance were tied at 13 apiece. The chosen course was roughly 8 nautical miles and Séance won the race in just over an hour at times reaching a thrilling10.5 knots. Kindred Spirit came just ahead of Una at the line to take second place. It was Una however that managed once again to take home the series trophy. Note* Like golf the lower the number the higher the rank. Boats not able to make a race automatically receive 7 points for that race. Each boat discards the results of the worst single race result from their total. 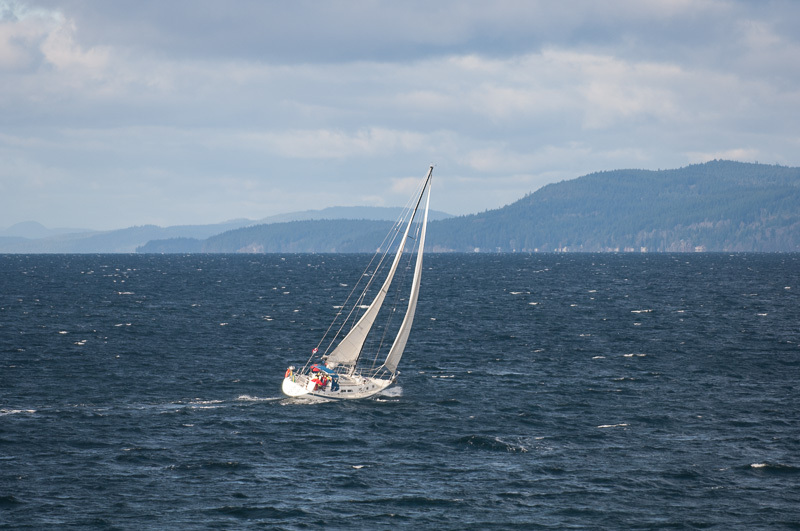 Race #5 started really really slow with barely enough wind to get us past the start line at Grief Point but with little but the shear power of optimism we eventually found the wind and lots of it and made lunch right on time at the Texada Inn. 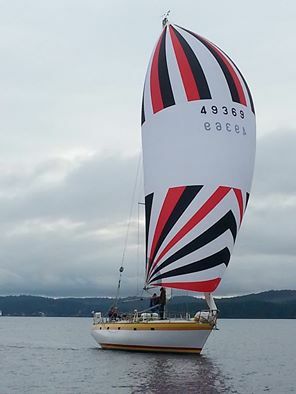 Congratulations to Terry Norault and crew for his first win on only his second race on his new boat Solitude! Without a breath of wind to be felt 5 valiant crews set out to race and perform in front of the town. 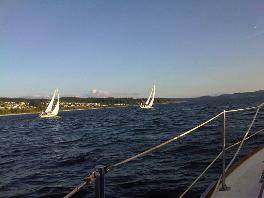 No wind and a northbound current had us going backwards in our attempts to just get to the start line. 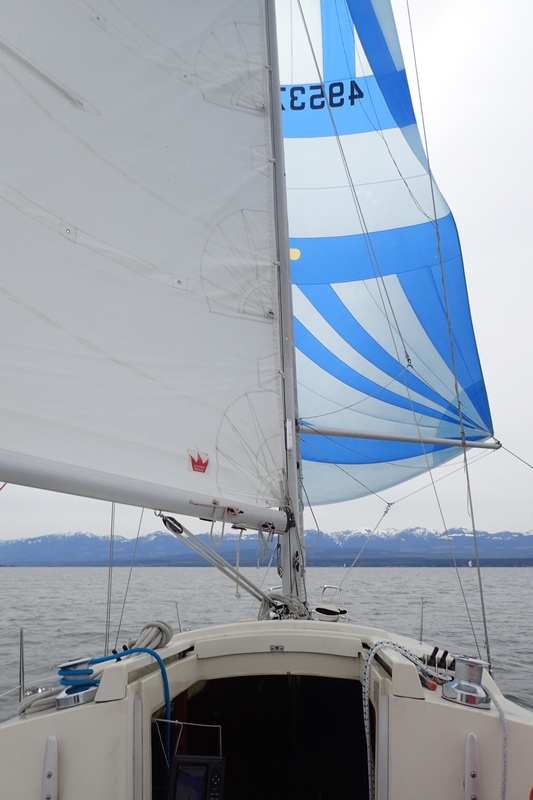 As we ventured further out into the straight a gentle breeze filled in and freshened and before we knew it we were gliding along at over 5 knots beneath colorful spinnakers. It turned into one absolutely beautiful day to be out on the water in a sailboat full of friends and another successful race was completed in under 2 hours. Winds were from the southeast at 5-15 knots. Once again Una had the best start and this time managed to hold the lead. Rain, heavy at times was hardly noticed by anyone. The 6 nautical mile (12 km) course was completed in just over an hour. Winds were from the southeast at 15 knots gusting to 25. Again Una had a fine start but again it meant little. Like a repeat of last week Séance soon took the lead and Kindred Spirit managed to squeeze into 2nd place on the upwind leg to Grief Point. The race was fast and complicated taking in 6 turning marks and 5 legs in a distance of roughly 6 nautical miles. In the end victory went to Séance with a happily cheering crew while Kindred Spirit managed 2nd place by just 10 seconds in a tense duel with Una. Our 2018 Fall keelboat racing series will begin Saturday, Sept. 8th. If you wish to compete or crew please show up at our clubhouse at 9:00 am Saturday mornings. The races begin at 10:00 am and last about 2 – 3 hours. All crew must have an approved personal flotation device and all boats competing must meet club safety standards. We race every Saturday (weather permitting) with the last race taking place Nov. 10th. The prestigious Sheerwater race (around Harwood Island) will take place on Saturday Oct. 13th which again is open to all club members. (The trophy goes back 40+ years). 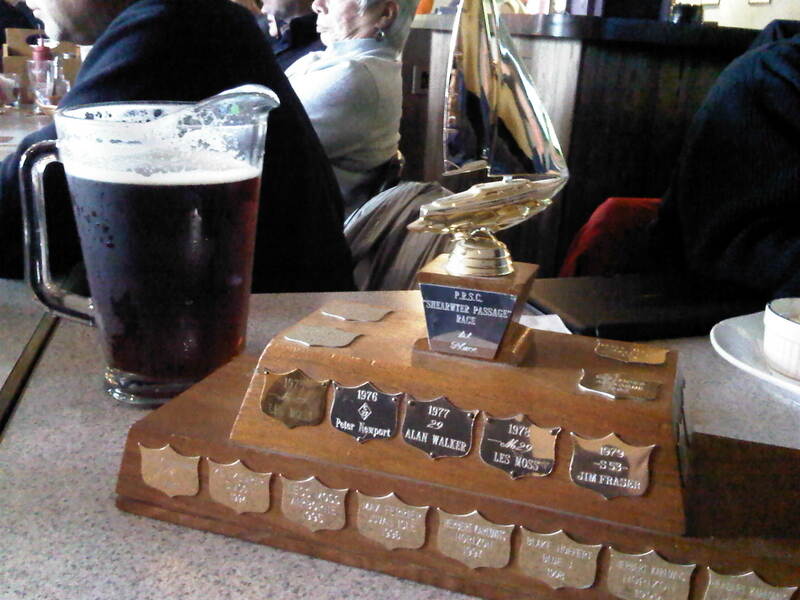 Come on out to share in the camaraderie and improve your sailing skills and perhaps even win some hardware for the mantle. 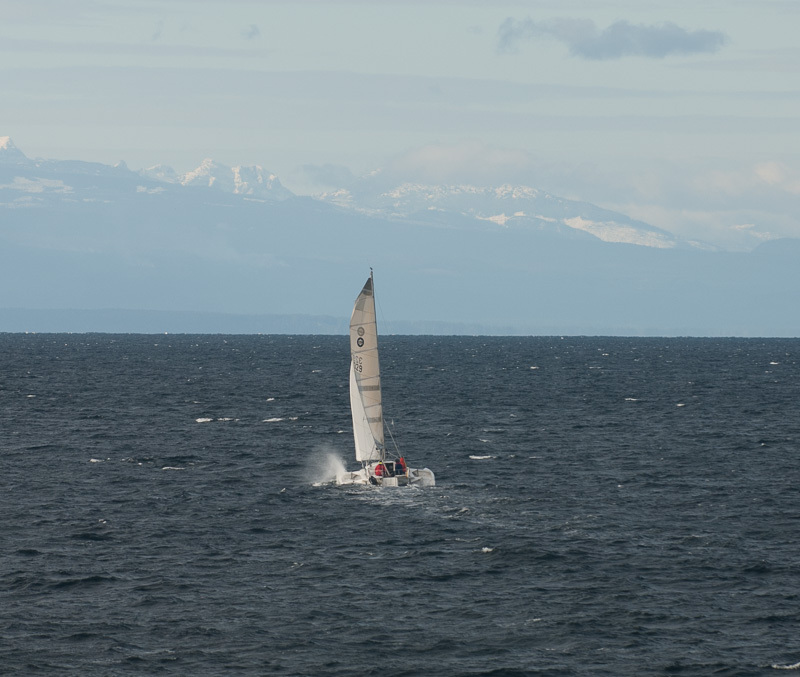 This year’s Algerine race route started at the Bell Buoy at the entrance to Comox harbor , took Vivian Island to Starboard and finished offshore of the lookout south of the south boat harbor in Westview. 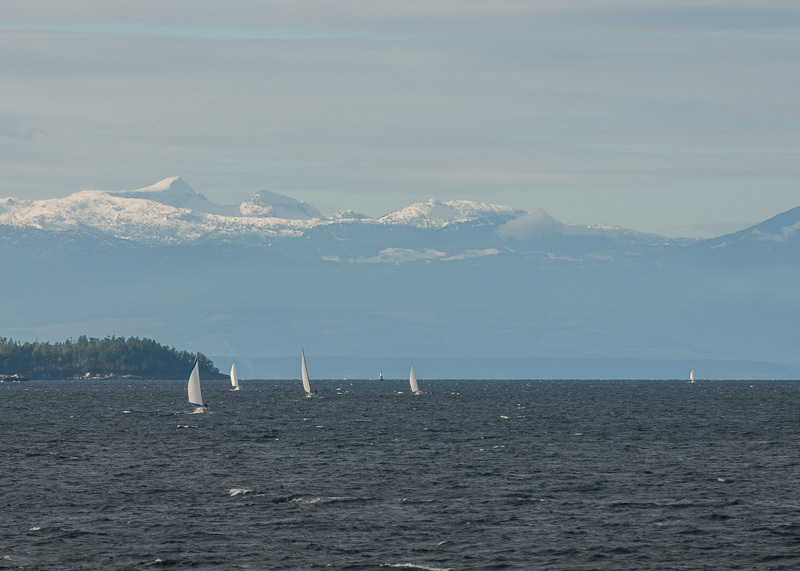 On the morning of May 20th eight hopeful keelboats headed out from Comox to start the race. Two came from Deep Bay, three from Comox and three from Powell River. 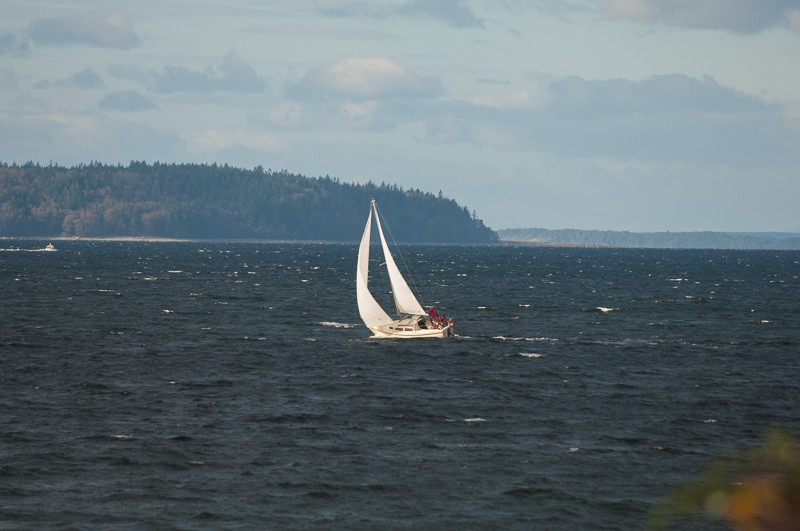 The winds were forcast to be south east 5 – 15 knots and slowly dying off butinstead came from the North. The weatherman did get the speed right though, especially the dying part. We had a great start just before 9:30 am. with a good fresh breeze filling our sails. The boats easily locked 5 knots. Conditions held for the front runnersas far as Vivian Island where things got a bit tricky. A strong north running tidal current swept a couple of boats too far north while another fell into a no-wind hole just west of Vivian. We watched it all unfold from the back of the pack as Una had a slow start and just couldn’t find the wind groove that most of the others were in. We watched Séance with her newly modified genoa slip past one boat leaving them dazed in her wake as she set her sights on the next one in front of her. With Una and Reprieve languishing in the back virtually without steerage at times, Séance was the only Powell River boat that stood a chance. 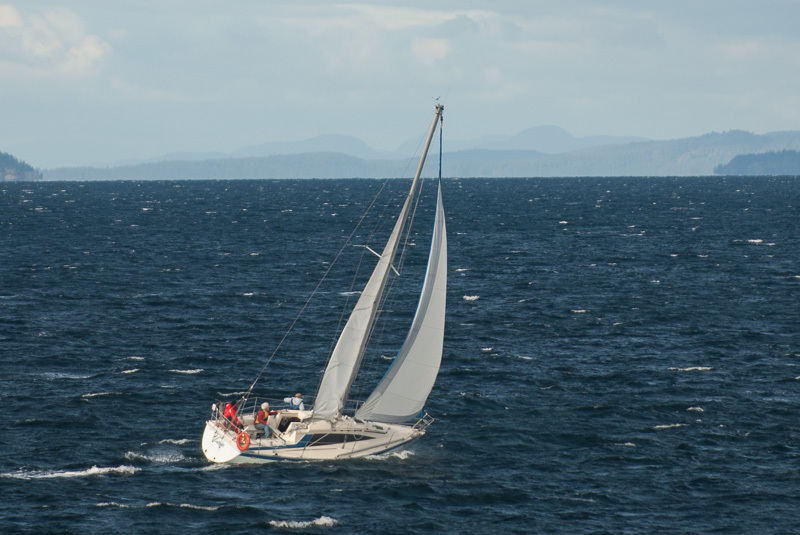 After Vivian with the tidein her favour she sailed south up Malaspina Straight and then jibed to the finish only to have the tide change direction and the wind drop. Over an hour would pass before she could inch her way across the finish line. Only 3 boats managed to complete the race. First place in corrected time went to Tom Gornall of Comox (once again) while second place went to Laser, another Comox boat. Séance finished in third place. Congradulations to Brian, Bob and Kim for persevering. A big thank-you as well to Terry Noreault for standing by for 4 hours on Sail Mates to take the time of those finishing. Also a really big thank-you to Alane and Bonnie for organizing the dinner at THE LITTLE CURRY HUT where the food and service were excellent. Everyone was very impressed. here to edit this text. Our anticipated Spring series was launched on this warm, sunny day. A brisk north-west breeze at the start slowly diminished to a mild westerly allowing 3 out of 5 boats to finish. A large pack of white sided dolphins were seen playing in the distance. A decent start and a well behaved spinnaker made the difference for Una as she managed first place ahead of Kindred Spirit. The Spring Series of keelboat races begins next Saturday, April 21st and is open to all club members. Those skippers not presently club members are welcome to join in on 2 races however to compete further in the series they must join up. If you wish to compete or crew please show up at the clubhouse at 9:00 am. The races begin at 10:00 am and last about 2 – 3 hours. All crew must have an approved personal floatation device and all boats competing must meet club safety standards. We will race every Saturday (weather permitting) with the last race being on June 9th. The only exception at this point will be on the May long weekend when our boats will compete in the annual Algerine race which will be held on Sunday, May 20th. This year the Algerine will begin in the Comox harbor and end in Westview. The Powell River boats will need to cross over to Comox on Saturday, May 19th. and spend the night in Comox to be ready for the race. There was speculation earlier about hosting the Garden Bay club on the May 5th weekend however they have been unable to get enough interest in the idea as for them it entails a 3 day commitment. We especially welcome any new or old club members to come out and compete. As well as the great camaraderie there is the huge bonus of being able to develop your sailing skills with all the accompanying support and friendly advice you could ask for. If you have any thoughts or questions please call me at 604 483-3205. 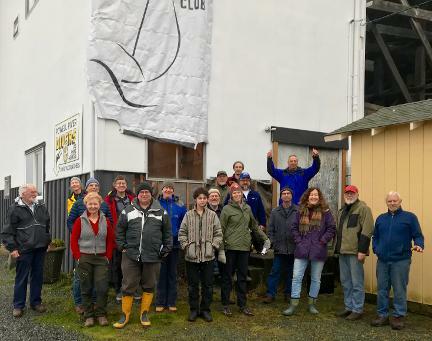 Last Saturday's skipper's meeting at our new clubhouse in the tall white building in the South Harbour! Come join our club and have some fun! Happy New Year everyone! Its time once again to shake out the sails and give them some serious air. 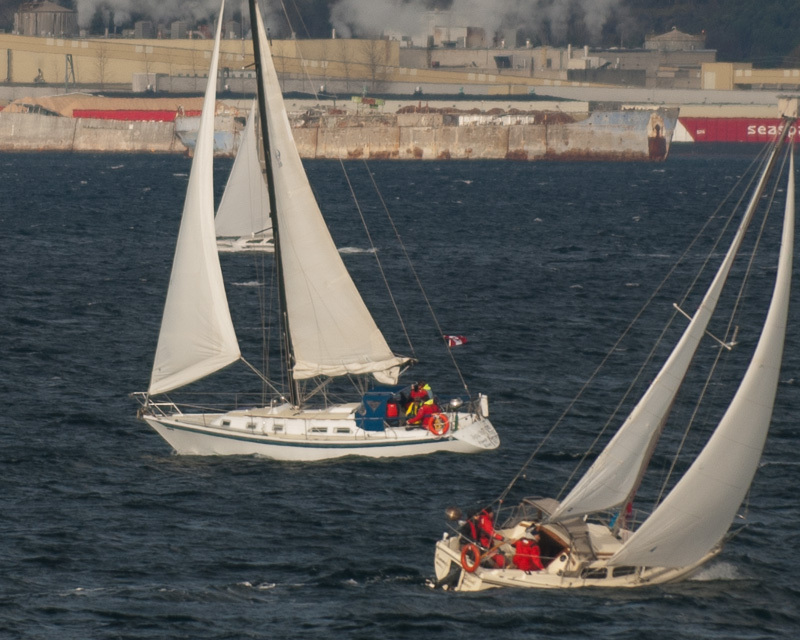 The 2018 Frostbite Series of keelboat races begins Saturday, Jan.13th. 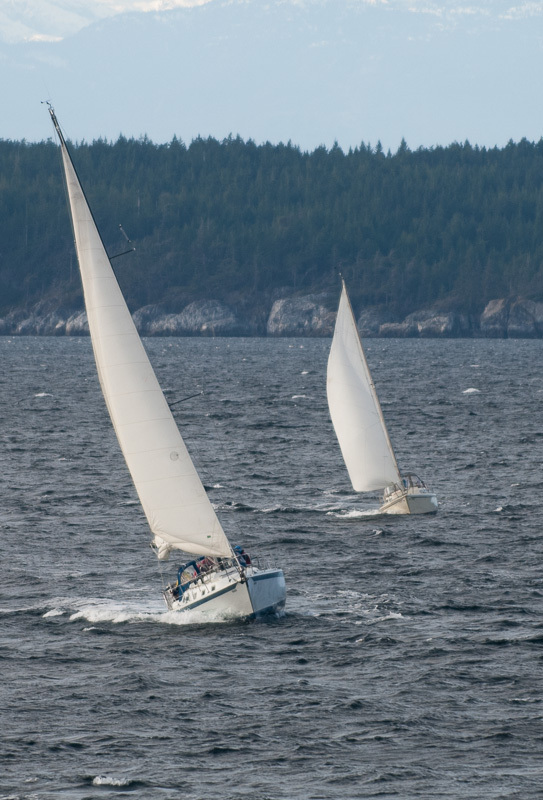 Skippers wishing to race MUST REGISTER their boats with the Race Committee at one of these meetings where they will receive a copy of the Race Instructions. Races will be held every Saturday as per usual with meetings scheduled for 9:00 am at the white tower (future clubhouse) on the seawall at the south end of the south boat harbor. We meet, discuss a course and start the race at 10:00 a.m. usually finishing between noon and 1:00 pm. All crew members must have an approved personal floatation device and all boats competing must meet club safety standards. We will race every Saturday (weather permitting) for 7 consecutive Saturdays with the last race being on Feb. 24th. Please direct any inquiries to myself, Lauritz Chambers, race coordinator. 604 483-3205. This years Shearwater Race began at Willingdon Beach and followed a clockwise direction around Harwood Island, through the Shearwater Passage and back through the start/finish line at Willingdon, a distance of some 16 nautical miles. Six hopeful keelboats and one trimaran entered the race with crews pumped for the chance of owning the prestigious trophy that’s been presented since 1975. Predicted south-east winds of 15 to 20 knots for the late morning were to drop to 10 to 15 however there was little confidence in the forcast. Until the final leg home from the northern end of Harwood back to Willingdon, all boats were in contention for a win but as we rounded the Harwood spit and started the homeward beat, strong, gusty winds and pounding waves gave advantage to the bigger boats. 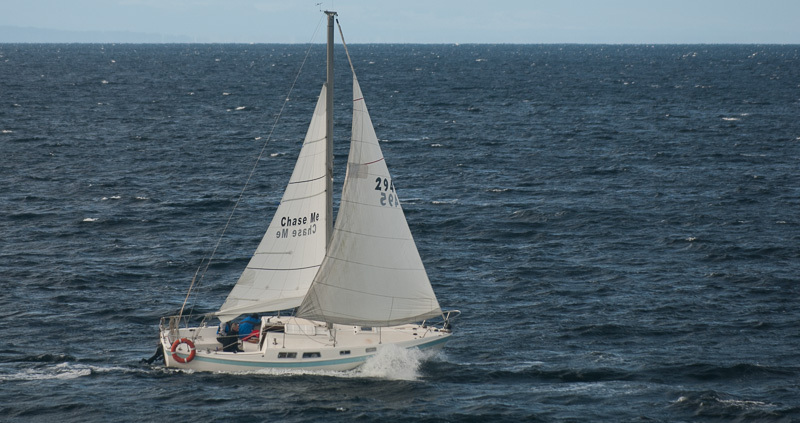 Congratulations to skipper Chris Coldham and crew of Betsy B. for a fine win, crossing the line in only 2 hours and 58 minutes. Our records indicate the corrected time of 189 minutes to be a new club record. RACING UPDATE – FALL 2017! Our fall racing series will commence Sept. 9th this year. We will race every Saturday weather permitting with the last in the series being held on Nov. 11. for a total of 9 races. . The prestigious Sheerwater race (around Harwood Island) will take place on Saturday Oct. 21st, which again is open to all club members. (The trophy goes back 40+ years). 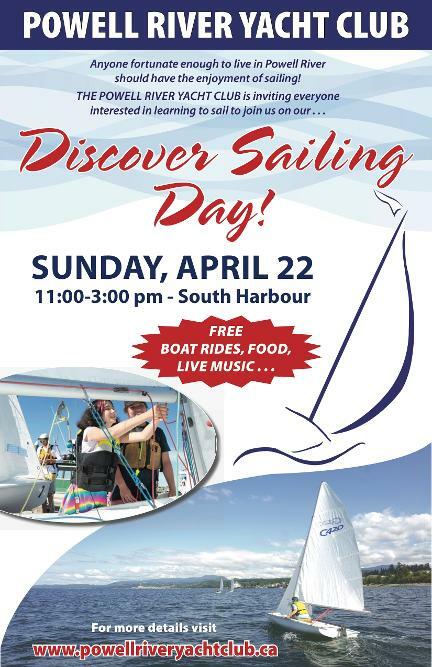 Come on out to share in the comradery and improve your sailing skills and perhaps even win some hardware for the mantle. We especially welcome any new or old club members to come out and compete. As well as the camaraderie there is the huge bonus of being able to develop your sailing skills with all the accompanying support and friendly advice you could ask for. It was an exciting and successful Fall racing series with 8 races completed out of a possible 9. The races were often faster than expected with boat speeds often exceeding 6 knots. Although we allow a full 3 hours for the races, five of the eight races finished in well under 90 minutes. Una once again prevailed in this series however there are strong competitors fully capable of winning on any given day. 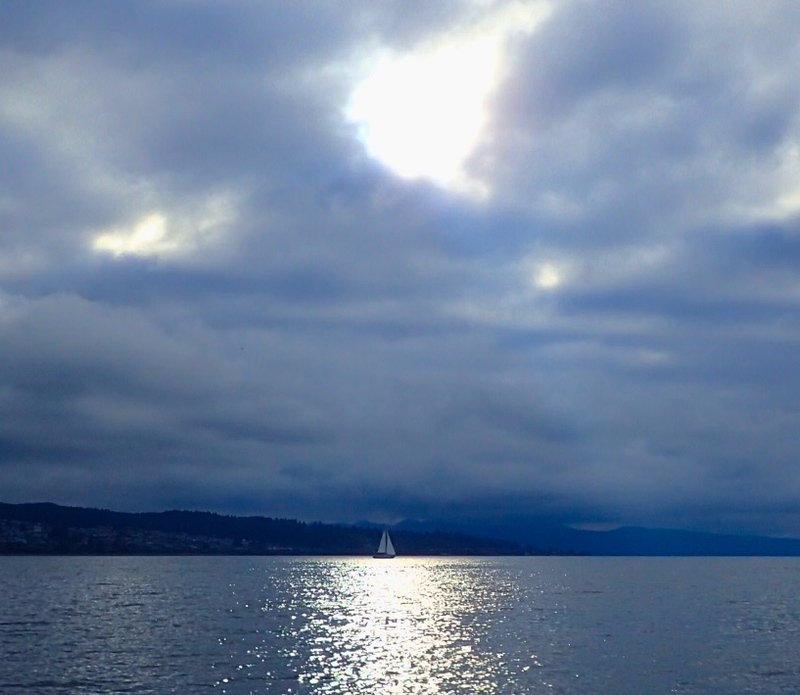 Wind – West 5 – 10 knots. 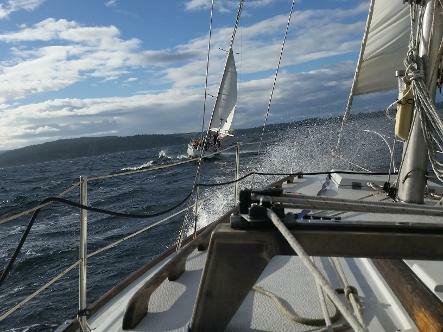 Our spring series wrapped up last Saturday with a race to Vananda in a healthy 10 knot north-west breeze. 5 boats participated in a close match followed by picnic on the Vananda dock. It was great to have Naïeve and Summer Wind join in for the final. The results had Kindred Spirit crossing the finish line first with Una just seconds behind and claiming first place in corrected time. The results however were somewhat misleading. 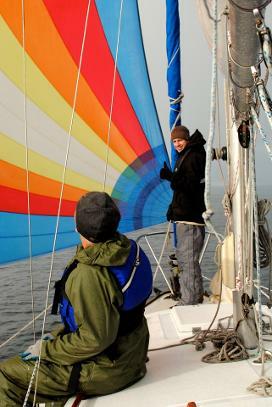 Una was the only boat to fly her spinnaker, giving her a significant advantage. Otherwise in corrected time she would likely have come in dead last. As well after crossing Malaspina Strait the winds in Sturt Bay suddenly veered causing everyone a bit of grief with resulting changes in placement. The close finishing times show everyone had a reasonable chance of winning the race. We can look forward to great competition in the coming fall series. 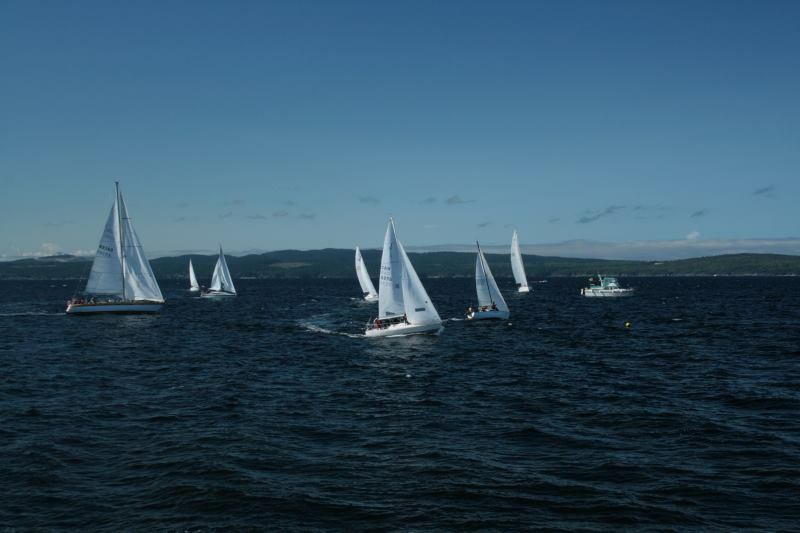 Due to the lack of wind the race start line was moved to Cyril rock outside of Blubber Bay. 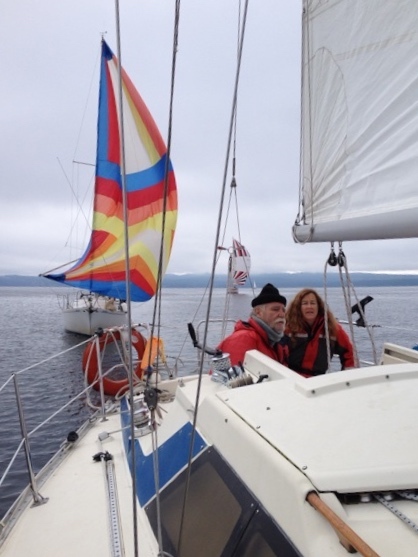 Thank-you Kim Brown for using Kindred Spirit for the committee boat and Ray Hogan for helping with the start flags. A gentle westerly began to build at the start and held for the majority of the race allowing the early finishers to complete in just over 5 hours. 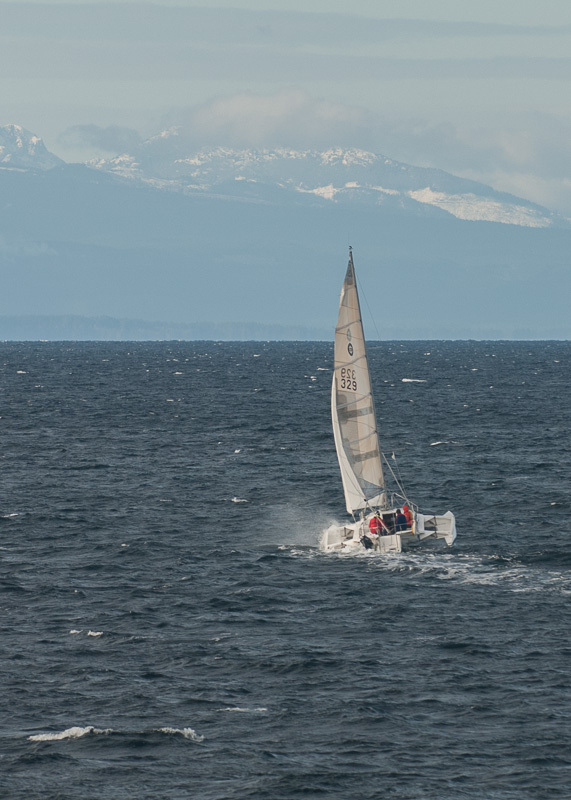 The chosen course was to take Vivian Island to port and finish in Comox harbor, a distance of 23 nautical miles sailed in mostly 10knot winds. 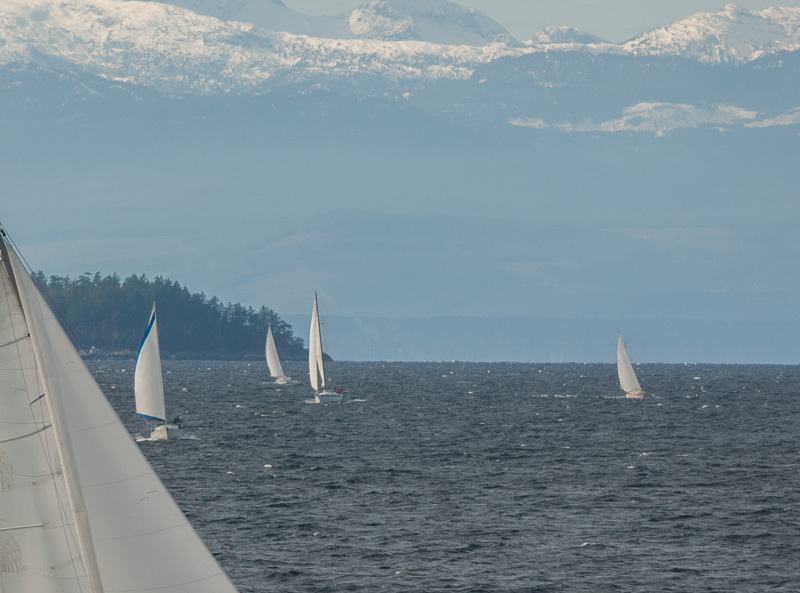 Four boats from Comox, one from Deep Bay and 3 from Powell River were entered. It was an awesome and entertaining race between totally engaged, competitive crews. A great meal in a Toscano’s restaurant in Comox followed. Tom Gornall, skippering his J24, Nyyak in excellent form received both the Algerine trophy for the win as well as the 1st across the line Credit Union trophy. Una, placed a respectable second with Tenacious in third. Wind – North west 5 – 10 knots. Hi Powell River!! Please cheer us on! Sunday 9 am south of the South Harbour the annual Algerine Race will start. 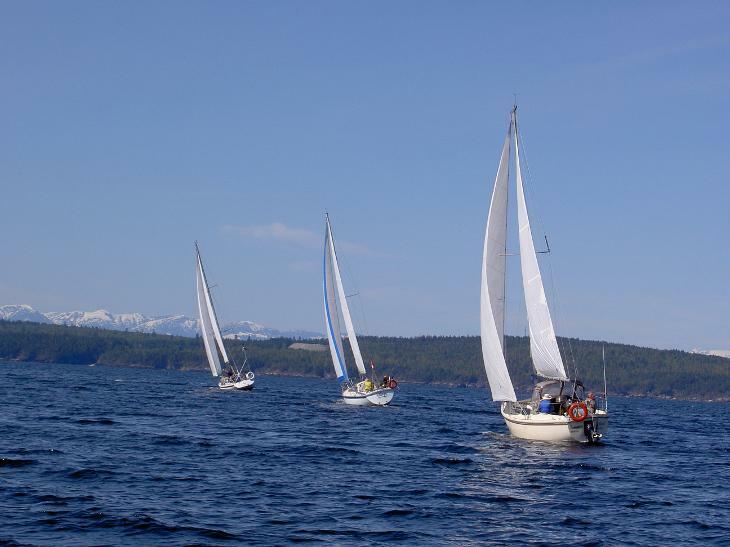 3 boats from Powell River and 7 from Comox will take part in this years regatta over to Comox. It will be fun to watch for sure!! Our spring racing series will commence April 22 this year. We will race every Saturday weather permitting with the last in the series being on June 10th. for a total of 7 races. The one exception will be the May long weekend (May 20 – 22) during which the annual Algerine race will take place on Sunday, 21st. pitting the Comox club against our Powell River club. Southeast winds of around 10 knots kept us moving quickly around a challenging course of 5 short legs totaling about 6 nautical miles. Una led for the first leg but then it was Kindred Spirit out in front for the rest of the race taking line honors and the race in corrected time. Every race gives a lesson and last Saturday’s was no exception. If you think you can depend on a westerly to remain somewhat constant you’re fooling yourself. Beating into a north-west 5 knot breeze we headed to the mill mark. Rounding the mark we prepared the spinnaker for a long downwind run but just as we were about to raise the big sail the wind veered and came out of the west at 15 – 20 knots. 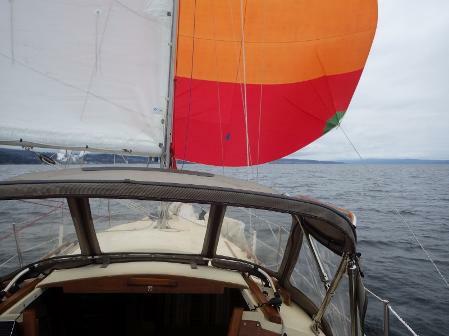 Instantly the apparent wind was from ahead and we were quite happy the spinnaker was still bagged. Una led for 3 legs only to have Kindred Spirit pass on a sprint to the finish to take line honors. With southeast winds gusting to 30 knots we had an exhilarating race covering a 9.5 nautical mile course in 1 ¼ hours. Congratulations to Séance as she got off to a good start and led to the finish for line honors and the win in corrected time. Course: Grief Pt. – South mid-channel – South mark – South Boat Harbor. A glorious start to our Spring series. 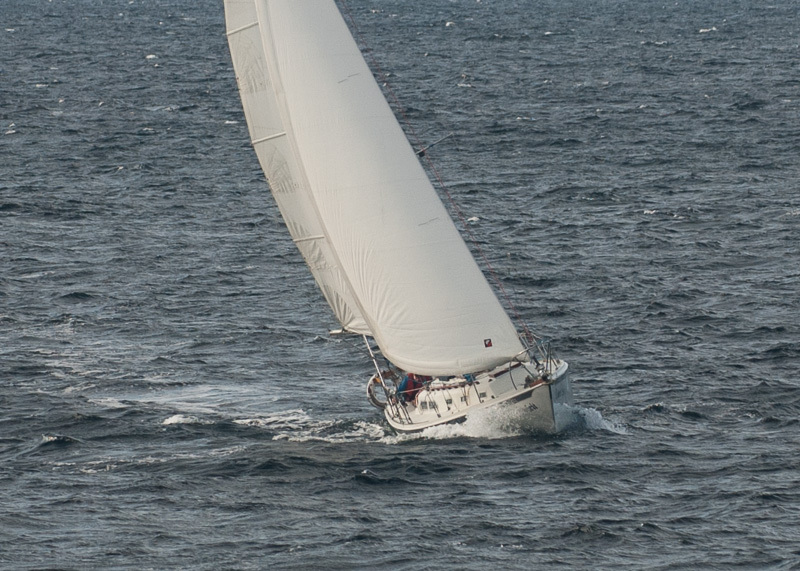 A 5 – 10 knot westerly breeze had the fleet of five complete the 5 ½ nautical mile course in 2 ½ hours while the rain held off. Una got off to a good start and managed to lead the fleet without being seriously challenged. It’ll likely be a different story next week. Stay tuned. Spring Series Results are in! Summer Keelboat Racing- Monday Night Fun Races finished August 26th.This series is super casual and designed to help out the "New-to-Racing-Crowd". Our experienced racers come out for a ride on your boat to guide you through your first race experience. Or, you can learn to crew - this laid back approach has been a wonderful addition to our keelboat racing program. Always fun! 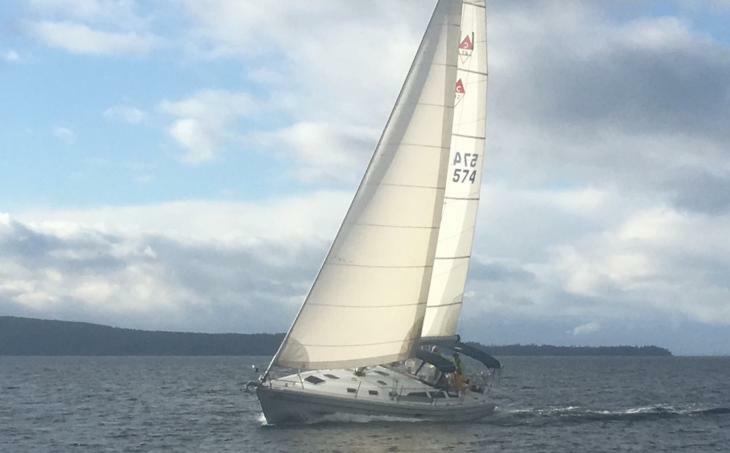 An exciting day of racing between the Comox Sailing Club and Powell River Yacht Club began Sunday morning in gusts of 20 knots. An enthusiastic crowd of fans gathered on the Willingdon Beach breakwater to send off the competitors. PRYC was represented by Alegria a Dufour 45E, Seance a custom 46, Una a Yamaha 30, and Sovind an Islander 30MKII . 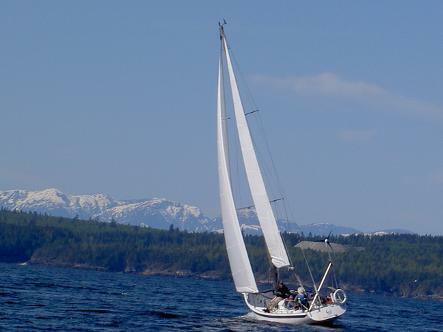 Representing Comox Sailing club Nyyak a J24, Tenacious a San Juan 24 , Laser a Laser 28. Alegria flew to a record breaking 3 hours 57 minutes and 50 seconds...winning both the line honors and corrected time trophies. A remarkable achievement on a course of 26.2 nautical miles! Alegria's win marks the first win for the PRYC in 5 years, and only the 3rd win for PRYC in the 40 year history of the race! Congratulations to owner Eberhard Heinzman, skipper Colin Jackson and crew representing the best of of Cooper Boating's advanced and offshore instructors. We hope to see the entire field for the Shearwater Passage this fall! A very special thank you to Bill & Pat Turner for volunteering to be our committee boat for the start Sunday morning! And our starters Kim & Gary for sending us off. 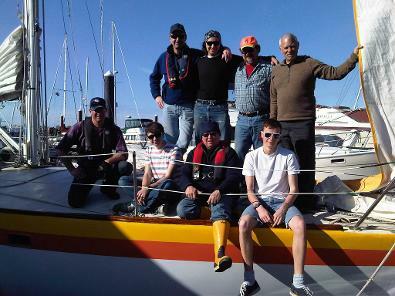 Congratulations to skipper Chris Coldham and crew of Betsy B. for a fine win, crossing the line in only 2 hours and 58 minutes. Our records indicate the corrected time of 189 minutes to be a new club record. 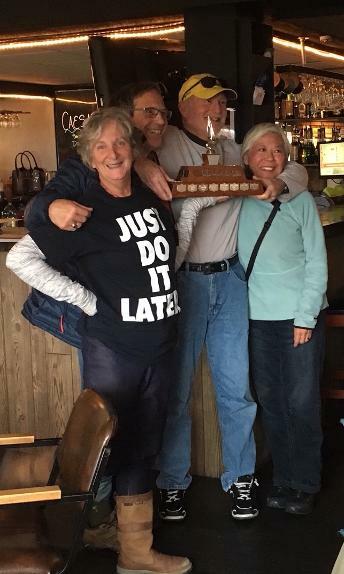 Team "Una": John, skipper Laurie and Monique, winners of Fall Series! At the last race 2 humpback whales said hello! The picture shows Séance with one of the whales in front of Westview. 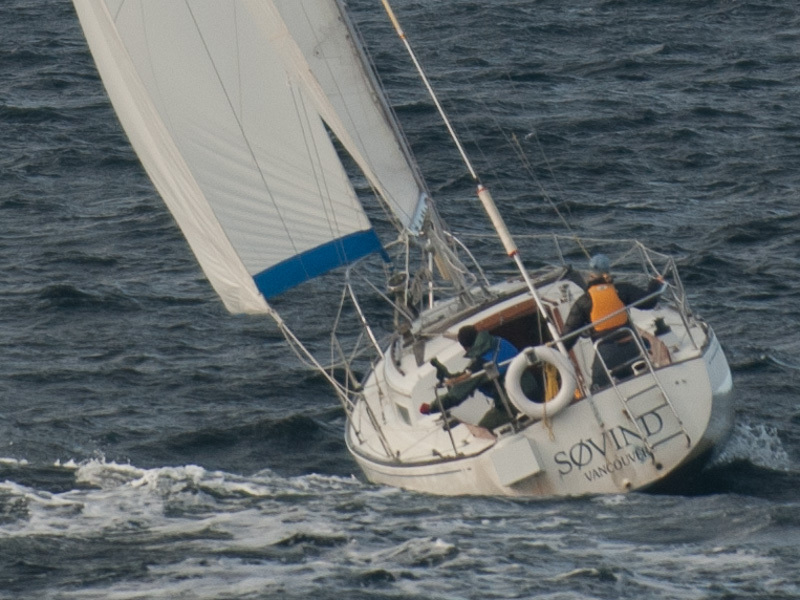 Una followed by Sovind, who is "stealing"her wind... Séance and Sail Mates in the background, not far away. What a beautiful day, what a beautiful sail we had! Look at our colourful spinnakers! April 18 race: Sometimes a picture says it all...no wind! SE 27 gusting over 35 knots for the Fall Series Oct 18th!